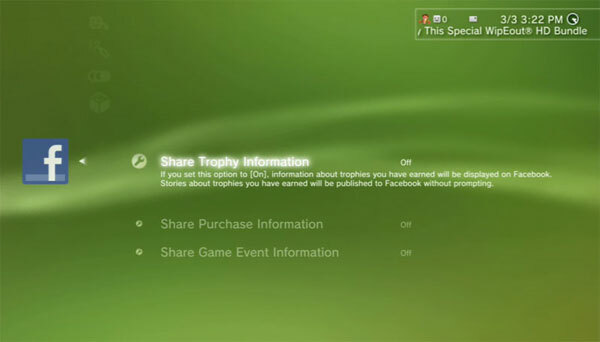 Sony has officially released firmware 3.10 for the PS3, adding Facebook support. That’s it. Facebook. So now you can post to your wall about how many trophies you have, how many kills you’ve got in Modern Warfare 2, or just how many times you’ve chopped someone in half in Brutal Legend. Have fun kiddies! As we all know, Facebook is the largest social network in the world and might be the largest in the US once it surpasses Myspace due to its extreme growth. Talking about growth, it’s homepage lets you sign up by filling out a few questions and you are good to go from there on. On the other hand, Myspace’s homepage is full of ads and too much content which overwhelms you, and also slows the site down. Even though Facebook has a nice look to it, I rather just use the application and finish all my bussiness there. Facebook’s iPhone app just got the recent 3.0 update. Most of the features on the app are the same, but there is a whole new look to it. It is organized into 9 categories and you can sort them the way you want and even add more categories. There are some significant changes that you will notice earlier than others. The app starts by showing the nine button grid which has pages you might want to visit often. The notifications show a whole list similar to the way of the actual site. The logout button is much easier to find unlike before. You can still take your own picture through the iPhone and post it as your profile picture. The photo viewing is still great as ever. There were also somethings I noticed that were unresponsive. When I went on my own profile, it did show me the wall tab in no time, but the info and photo tabs took quite some time to load up. Those were the only things that bugged me. Overall, I did not feel that the facebook app’s update was necessary because it was already so good, but I can say this update was a nice improvement and made me feel a bit more organized. I feel facebook is not only innovative on the site, but also the apps it makes. Sorry Myspace, you got a lot of catching up to do. Today, a Zune branded 1080p instant-on streaming content has been announced by Microsoft among other things and will debut in 18 countries. Facebook users can now link their account their Gamertag, and games will support Facebook Connect for sharing content online. Twitter and Last.fm are also included in the deal. Adding to that, Netflix users will now be able to browse the entire catalog instead of simply loading their queue, and Microsoft has bandaged their “Party Watch” system, so you’ll be able to watch videos with your online friends. Last but not least, there’s now live TV streaming for UK and Ireland gamers, who’ll get Premier League soccer live from Sky. Video startup is nearly instantaneous because of the back-end proprietary Microsoft technology developed by Zune that seamlessly transitions between many different bitrates and resolutions of video. Video playback will start at a low bitrate for fast download time and then ramp up to a higher bitrate and quality, up to 1080p with 5.1 audio. Features such as smooth fast forward and rewind that users have only seen before with local physical media. Social: We unveiled Movie Party, a feature where you can go to the movies with your friends whether you are sitting on the same couch or in living rooms across the country. Starting this year, you can share a virtual theater, see your Avatars (a virtual you) on the screen – all while you listen to each other laugh and cry together at the movie through voice chat on Xbox LIVE. New Regional Partners: Now, for the first time Xbox LIVE members in the UK and Ireland can watch live or on-demand TV with BSkyB on Xbox. Never miss a moment of your favorite live TV shows, sports, movies and family-friendly entertainment – even share your favorites with up to seven friends in an Xbox LIVE Party. XBL will also be adding a Games on Demand Marketplace on August 30th to sell full games online that match retail price. Here’s the best thing-you won’t have to use a XBL Point system. That’s right, just enter that credit card and pump out some games. Anyways, the most important, most amazing, most astounding feature of today, has to be Project Natal. Project Natal, that being a small black box which sits below your TV similar to the Wii’s yet bigger, will handle multiple users and will detect every move you make, like kicking a soccer ball with your feet, or punching something with your hand. No controller will be needed. No released date so far. Video of the device can be found at Engadget. Chris DeWolfe, Myspace CEO, is stepping down from his position, but will remain in the company on the board as a strategic advisor. In a press release, News Corp. said DeWolfe’s contract would not be renewed by “mutual decision,” and that the company was in talks with MySpace President Tom Anderson to assume “a new role in the organization.” If you have a Myspace account, I hope you know who Tom is (one of the first friends you get to have!). The new CEO is not announced yet, but Owen Van Natta seems to be the leading guy to take over the position. Myspace is the top social network in the US, while Facebook is leading worldwide. Some predictions say that Facebook might become the leader in US as well after a couple years. Personally, I have both accounts and definetely prefer Facebook, but Myspace is better in some cases like profile customization with HTML. Facebook v1.5 for BlackBerry Out in the Open! Hooked on Facebook®? Now you can take Facebook with you on your BlackBerry® smartphone wherever you go and stay logged in as long as you want. Download this free application today and take connecting with your friends to a whole new level. Receive instant notifications on your BlackBerry smartphones home screen. Connect your Facebook friends with your BlackBerry Address Book – including profile picture integration which brings a whole new meaning to caller ID. Stay on top of your life with birthday reminders and event integration into your BlackBerry Calendar. Take Facebook® with you wherever you go – now with even more integration with your BlackBerry® smartphone.